The journey of the archetypal hero as described in Joseph Campbell’s book “The Hero’s Journey” remains a powerful tool in helping us to understand the path to personal development and transformation. Campbell depicts the journey as a circle of growth, we leave home and embark on a journey from which we return forever changed. The Hero’s mandala is the call to transformative growth. 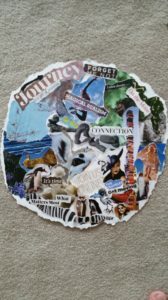 This contemplative day will include time to create a personal mandala and to reflect through journaling and guided meditation on your path to wholeness and integration.